Is this the best road bike ride in North America? At the end of a two-week trip through the U.S. Northwest with my wife and dog (more pictures forthcoming), I cycled the 33 mile Rim Drive loop in Crater Lake National Park. What a stunning ride on a warm, sunny day. If anyone, who has done this ride, knows of a better road bike ride in North America then I'd like to see some evidence! It's challenging, incredibly scenic and fun the entire ride (no dead spots) with 3800'+ of climbing and never descends below the 6500' elevation mark. 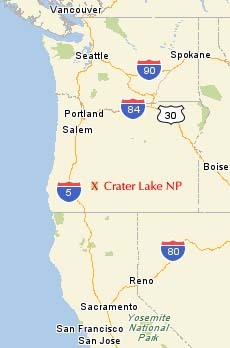 Add an additional 10 miles and 800' of climbing if you start from the Mazama campground like I did. When clear of snow, there are several optional out & backs that can add at least 15 miles. 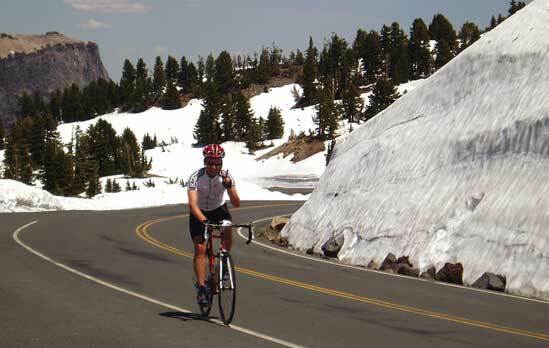 Here's bicycling information and weather data the National Park Service provides for planning a bike ride around the lake. If you'd rather stay at a luxury resort than sleep on the ground then get your Ben Franklins ready and check out the Crater Lake Lodge. 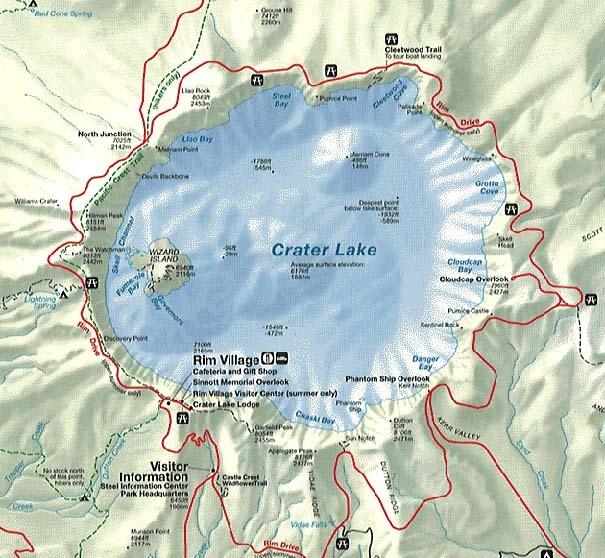 The skinny on Crater Lake is this. It was formed when a 12,000' volcano erupted and collapsed into itself 7,700 years ago with explosion about forty times as powerful as Mount St. Helens in 1980. It then filled with rain and melted snow to a maximum depth of 1,943 feet -- deeper than any lake in the United States and apparently one of the cleanest because no streams (pollution) flow into it. The depth and clarity of the water and it's ability to absorb all colors except blue and violet produce the unique brilliant jewel blue color. It snows so much that the full loop is only open for 3 or 4 months during a typical year and this past month, the park had to re-close the east rim road after a late snowfall. 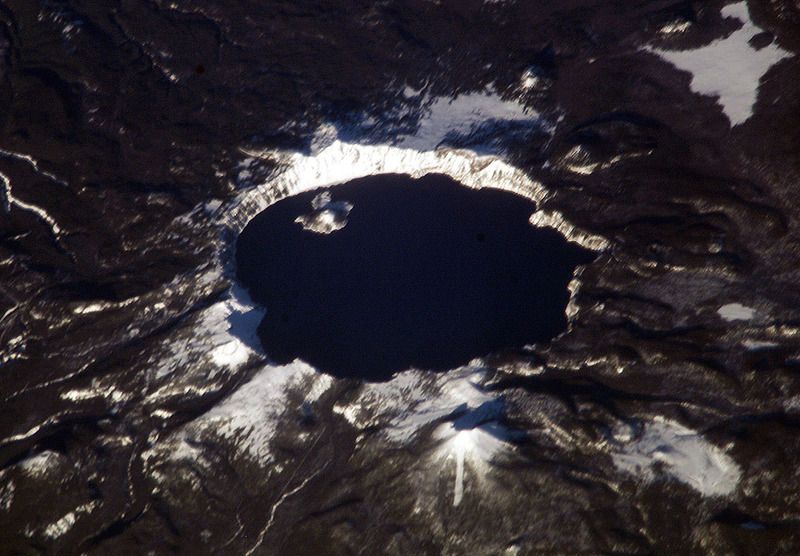 Remember me taking this picture at Crater Lake? Just got home from vacation...I live in Illinois (a little different elevation from Oregon.) Anyway hope this works.....checked out your website.....cool! Hillman Peak from Discovery Point... killer view or what? The east side of the Rim Drive was closed to vehicles. Another exclusive! However, it was unclear how I was going to get out to Cloudcap Outlook - an optional part of the ride. Would Jobst have slogged on? A big snowbank or the edge of a glacier?